I felt I should have been reporting for Bon Appétit magazine. 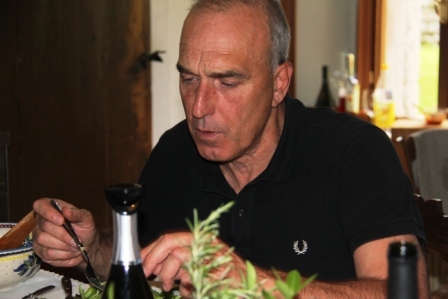 It was one of those fabulous food and people spreads – a multi-course meal in the huge, homey kitchen of a 500-year-old house in a tiny Italian village shared by Italians and Americans. And, I was lucky enough to be part of it. Too good to be true. 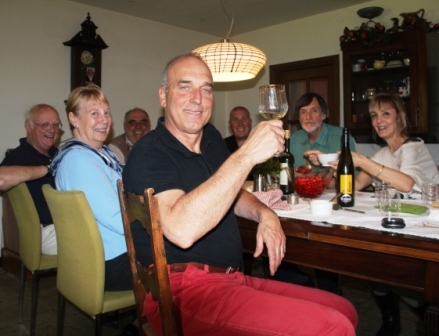 Thanks to our friends Noel and Carol, whom husband Bob and I know from our days together in Germany, we were included in this memorable feast which went on for five fun-filled hours. 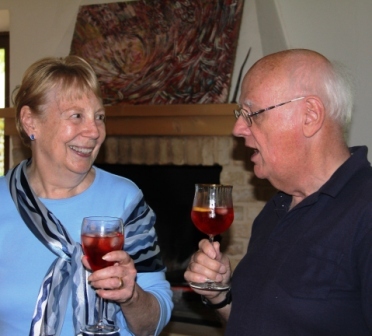 Noel and Carol have retired to northern Italy where they enjoy la dolce vita. We were their houseguests. family’s ancient home, Palazzo Policreti Negrelli in Aviano, which has 47 rooms and has been in his family for more than 200 years. The original owner, engineer Luigi Negrelli , played a significant role in the construction of the Suez Canal. The food: Zeta was the coach, Fabio the student who made a big patch of Ligurian pesto with guidance from the chef. They wanted to share their creation with friends, hence the lunch party. A refreshing cocktail, a combination of Campari, white wine, Prosecco, and Schweppes, got the afternoon of to a festive start. The meal began with fresh ricotta, so creamy and delicate, served with homemade mango chutney and caramelized figs with balsamic vinegar. The cheese was locally produced, and it was exquisite with the tangy chutney and figs. 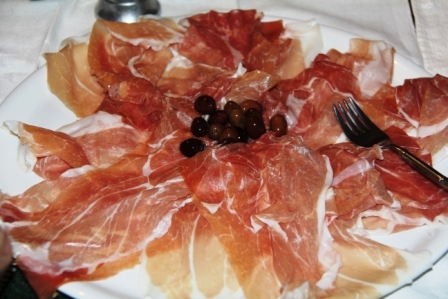 There was a platter of prosciutto from the local butcher who cures it himself, we learned. And a salad — greens, tomatoes and luscious mozzarella di Bufala with pungent olive oil from Puglia and black salt from Cypress. 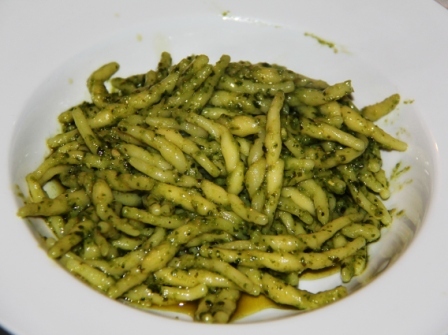 The main course: trofiette, a Ligurian pasta, with the pesto which had been prepared with pecorino. “Never use parmesan,” insisted Fabio. This was followed by a bowl of spaghettini with the same pesto. The flavor of the pesto changes with the different type of pasta, we learned. It seemed hard to believe, but it was true. I preferred the pesto on trofiette, others liked the spaghettini version. This initiated an animated discussion of the difference between trofiette and trennette, another type of pasta… Food is definitely serious business in Italy. For dessert, aged Sardinian pecorino and pears. “It’s hard to get good pears…these are organic from Trentino… Never tell a farmer he has good cheese. Then he will eat it all, ” said Riccardo. The cheese was knock-your-socks- off strong. I loved it, but it was too much for Bob. 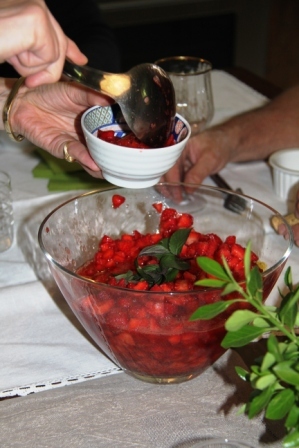 He had several helpings of the perfectly diced fresh strawberries that followed. 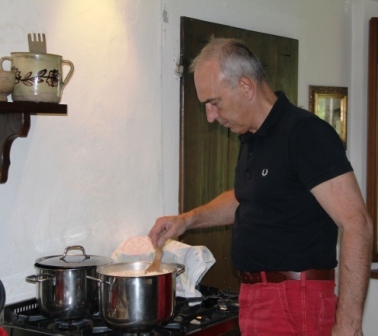 This prompted Fabio to tell of his grandmother’s fantastic crop of strawberries in 1986, the year of the Chernobyl disaster. A boost from radiation? 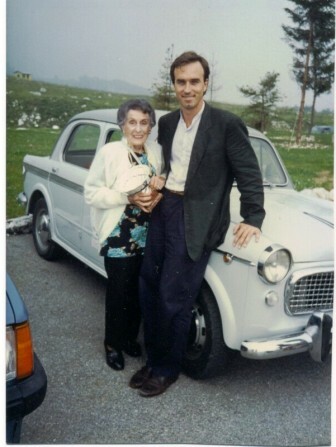 Fabio and his grandmother in 1996. We drank Fabio’s Pinot Grigio, followed by a strong red wine called Stroppolatini, then a Sud Tyrol Kerner as an after dinner wine. 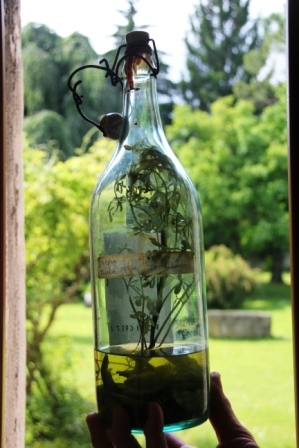 Some indulged n a rare 45-year–old herb Grappa to top off the meal. There were also chocolates, courtesy of Riccardo who brought them from a special shop in the Dolomites. All the ingredients for a magical afternoon: lively ambience, fascinating personalities, excellent food and amusing, entertaining, educational conversation covering everything from religion and politics, to the economy, movies — and food of course. Tales And Travel, continues to make me hungry. Here’s to the good life ! Thank you Fabio and Victoria. We loved every minute of our afternoon at Palazzo Policreti and were sorry to see it end. . Thank you Leah for your nice article. We enjoyed your company.Evviva!!! Salute!!! Fabio. What a wonderful meal and an unforgettable experience! The French term “convivialité” (living-togetherness ) is always used in relation to a meal. I cannot imagine a true social life that doesn’t revolve around food and wine. 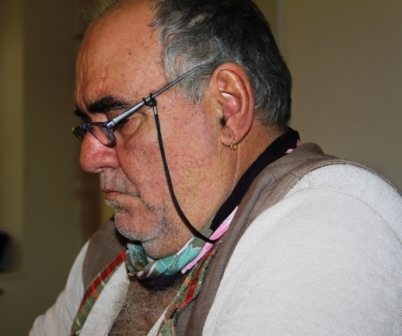 As A. Gopnik says, “The Table Comes First” ! How do non-foodie’s bond? You did a great job of describing not only what you ate and drank, but also giving a glimpse of the marvelous cast of characters. 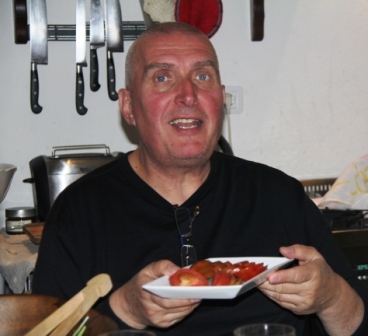 I hope we never lose our appetite for food…and, therefore, for life! Well said, Lynne, and so true. Bon Appétit. I seem to have dropped off your list of blog recipients. Please put me back on. Another great dining tale – especially when read from the gastronomic wasteland of the Phoenix west valley. Thanks. No Problem, Warren.. but you must be a subscriber since you received this. I encourage fans to subscribe through the blog post. I hope you and Barbara and cats will stay cool this summer. I didn’t;realize the flavor of pesto sauce changed with the type of pasta. Very interesting! Nor did I. Guess I need to pay more attention to the size and shape of pasta I buy.